Jennifer and Kevin McCoy’s Airworld was a series of interventions into the structures of global capitalism that ran from 1999-2000. The project began as a pirate radio station broadcasting from the 91st floor of the World Trade Center, where the McCoys participated in the World Views residency program, and quickly developed to include multiple projects across a variety of media including photo, video, and the web. 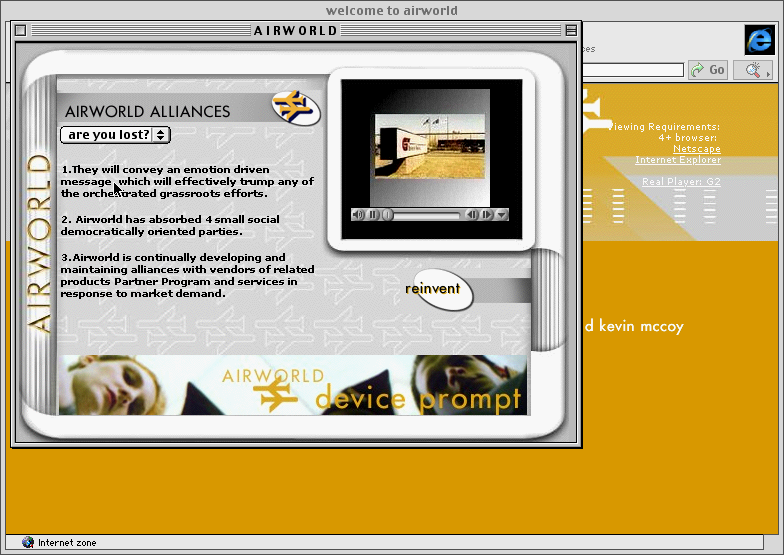 Airworld represented a new stage in the net art tradition of co-opting corporate language and modes of communication. Eschewing the overt activism of artists like The Yes Men and RTMARK, Jennifer and Kevin McCoy opted instead for a subtle, oblique strategy that mobilized confusion and misunderstanding to interrupt the corporate media sphere. 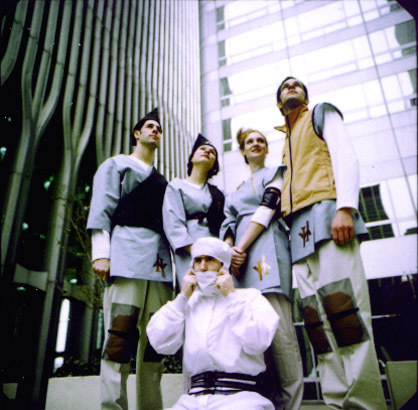 Jennifer and Kevin McCoy began Airworld in the spring of 1999, during their time at the World Views residency program in the World Trade Center. The location of the residency was integral part of Airworld’s beginnings, and it became a major source of inspiration for their investigation into the corporate world. The project started as a simple radio broadcast that could be heard from the West Side Highway. From there, the McCoys began to explore other mediums, taking a particular interest in the commercial internet. 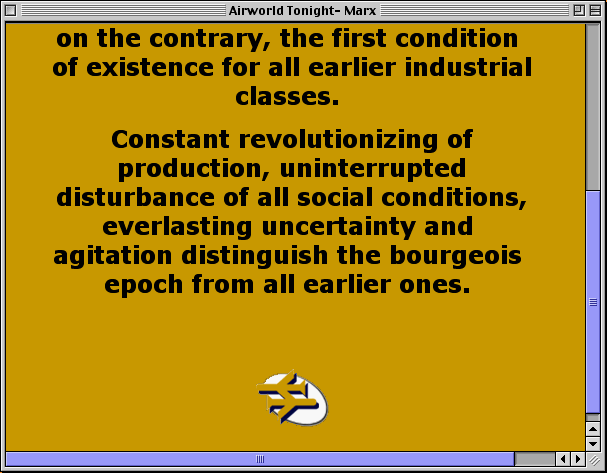 There were a number of online manifestations of Airworld, including Airworld Banner Ads, Security Desk, Jargon Machine, and Economic Forecasting. Read Alec Recinos’s interview with Jennifer and Kevin McCoy. Airworld Banner Ads launched in August of 1999 as part of the Emerging Artists/Emergent Medium series commissioned by Gallery 9 at the Walker Art Center, and consisted of one million banner advertisements that were distributed around the internet by DoubleClick, the digital ad services provider. Each banner ad featured photographs taken by Jennifer and Kevin McCoy at the World Trade Center overlaid with the Airworld logo and snippets of vague business jargon, such as “innovative response” or “option: business as usual.” When clicked, the ads would bring the user to the Airworld homepage (located at http://airworld.net). Jennifer and Kevin McCoy, Airworld. Screenshot created in EaaS using IE4.5 for Mac. 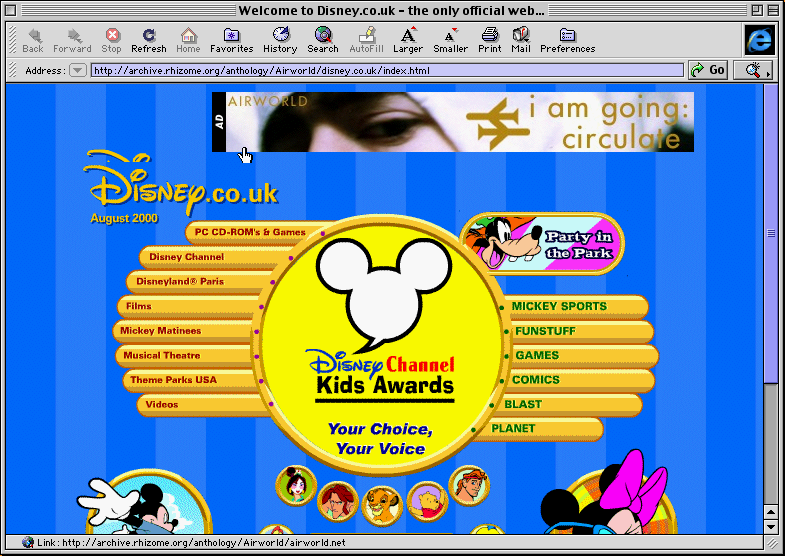 The Airworld Jargon Machine was hosted on the Airworld homepage, and used software to generate real-time collages of texts pulled from the corporate websites that hosted the banner ads, and slideshows of generic image search results from the then-prominent Altavista search engine. Out of all the Airworld projects, the Jargon Machine was most closely related to the McCoys’ past work, where they had produced software like Curlycue (1998) and Whirligig (1994), which allowed for the live and improvised remixing of audio, video, and images. Economic Theories created algorithmically generated, real-time remixes of prominent financial websites, superimposing Marx’s economic theories over the original content. By literally foregrounding the critique of capitalism, it cut through the creepy utopianism of financial services industry language to reveal its inherent contradictions. 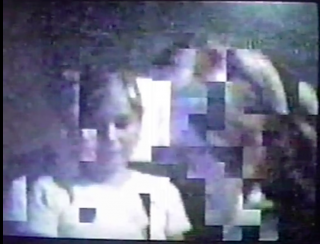 Beyond Banner Ads and Economic Theories, Airworld also included videos shot in the World Trade Center, live streams of found security footage (Security Desk), and the Airworld Flood Timer—a tool similar to Electronic Disturbance Theater’s Floodnet—that was produced in solidarity with the actions of Toywar. By encompassing such a broad variety of projects and media, Airworld détourned the structure of conglomerate corporations, where a parent company controls many divorced subsidiaries. Even though the internet has dramatically changed since the project’s end, Airworld still feels contemporary. Banner advertisements have never been so ubiquitous, and tech startups continue to promise a utopian future where everything flows seamlessly into the cloud. Jennifer and Kevin McCoys’ work has been widely exhibited in the US and internationally. Their exhibitions include the Pompidou Center, the Museum of Modern Art in New York, BFI (British Film Institute) Southbank in London, Hanover Kunstverein, The Beall Center in Irvine, CA, pkm Gallery in Beijing, The San Jose Museum of Art, Palazzo della Papesse, The Addison Museum of American Art, The Sundance Film Festival, and Artists Space in New York. Their work can be seen in the collections of the Museum of Modern Art, The Metropolitan Museum of Art, the Milwaukee Art Museum, the 21C Museum, and the Speed Museum. They received a Creative Capital award in 2003, the Wired Rave Award for Art in 2005, a Guggenheim Fellowship in 2011, and a Headlands Alumni Award in 2014. Their work is represented by Postmasters Gallery in New York and Johansson Projects in Oakland, CA.